Submitted by Surazal on 2014-12-15 07:30. 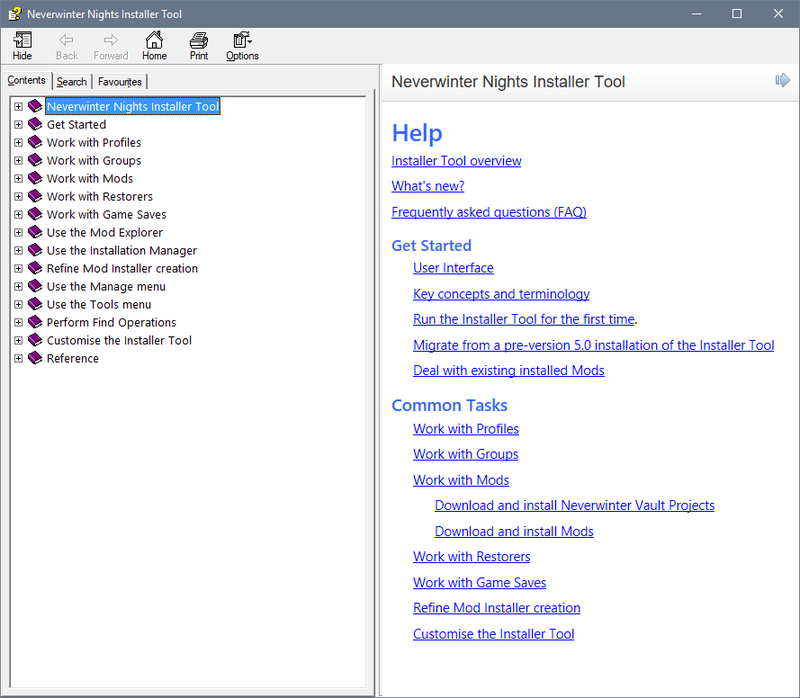 The Neverwinter Nights Installer Tool (NIT) is designed to make it easy to manage, install and uninstall your Neverwinter Nights and Enhanced Edition mods. The tool makes it safe to try out new mods because it restores everything to the way it was when you use NIT to uninstall mods. Navigate to the Project page containing the Mod you want to download and copy the web address (URL) to the clipboard. Select Download Project from the File menu and click Retrieve. Click Play NWN and play the new Mod. Click New Mod, enter the name of the mod and click OK.
Download all the files required to play the mod. Click Add Files to Mod and select all the files you downloaded. Neverwinter Nights or the Enhanced Edition. .NET Framework 4.6.2 or higher (Windows 7 Service Pack 1 or later). Installed by the Setup program if required. Works with the Neverwinter Nights Enhanced Edition. Automated conversion of movie files for the Enhanced Edition (BIK to WBM formatted files using FFmpeg). 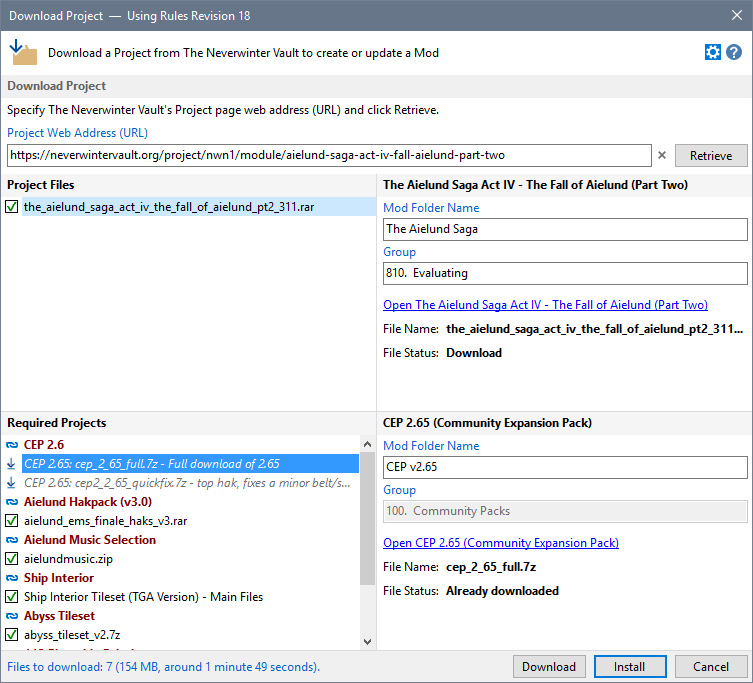 Constructs a Mod Installer from a variety of source file formats including BioWare Premium Module Installers, Zip, 7-Zip, WinRar and Exe files containing compressed contents as well as Community Patch Project (CPP) files. 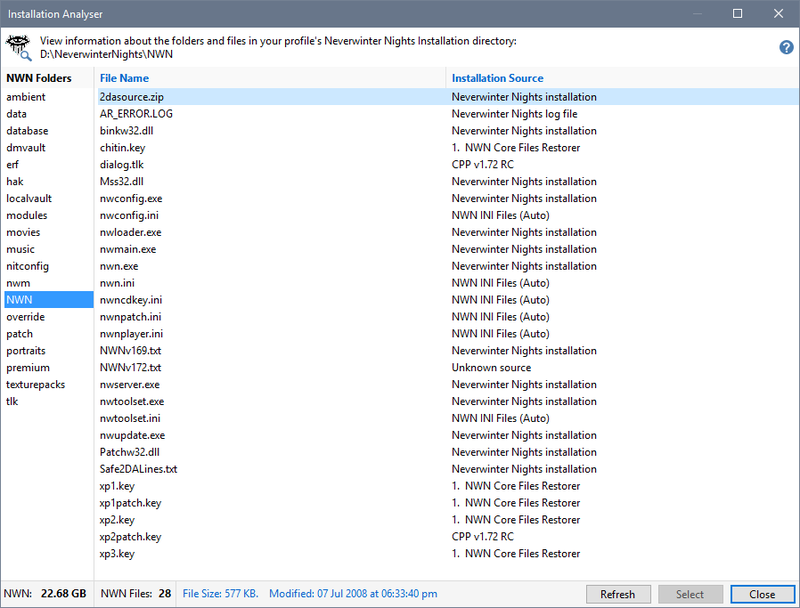 A Mod Installer is a NIT created folder containing all the files that need to be installed to use a Mod. Configure how files are associated with Neverwinter Nights folders using "maps" for file extension names, special folder and file names as well as an "exclude" list to ensure unwanted files are not included in your Mod Installers. Detects and resolves conflicts between different mods. Record information about each of your mods (Rating, Notes, link to download page, best weapon to use, etc). 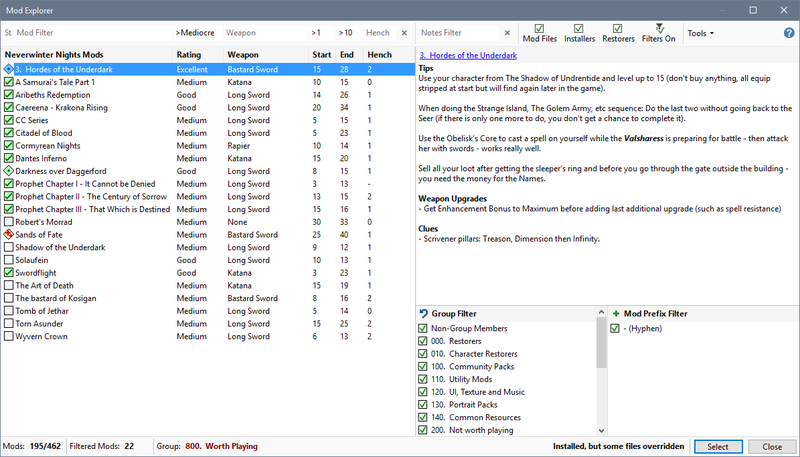 Categorise your mods into Groups to make long Mod lists more readable by breaking them into smaller sections and help deal with file conflicts. Create Restorer packages of the original Neverwinter Nights installation so you are always able to restore overwritten files. 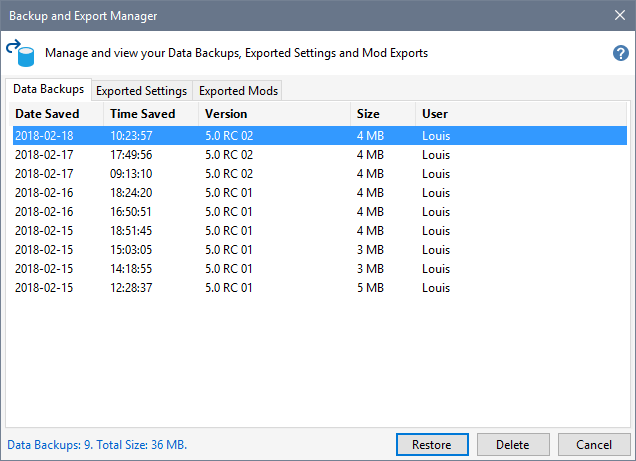 A Restorer is a special Mod Installer containing original or unowned files that can be used to reinstate contents when a Mod is uninstalled as well as create backups of character and other unowned files. Automated Restorer creation and maintenance of key files such as Neverwinter Nights INI and Database files. Automated record of how long it took to complete playing a Mod or campaign. 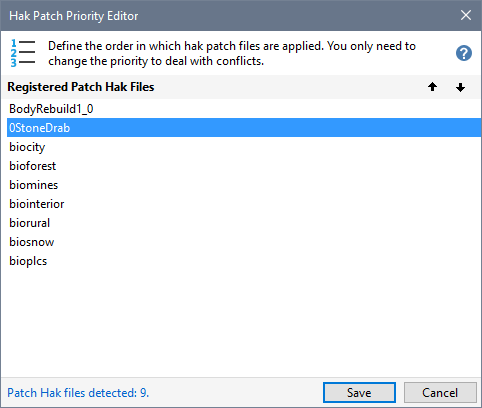 Supports HAK patch files, which includes the automated generation and maintenance of the required INI file. 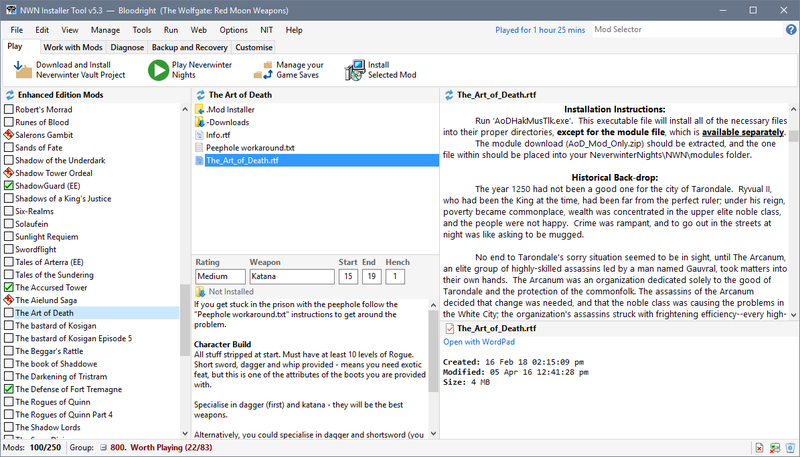 Publish your own Mods using the Tool to create and maintain compressed files containing your Mod's assets. The Game Saves Manager allows you to play a number of Mods concurrently by moving your current game saves to a backup folder and then restoring a previous backup of the mod you want to play. The Mod Explorer provides a view of all your Mods and associated Mod Information in a tabular format that you can filter using a wide range of criteria. 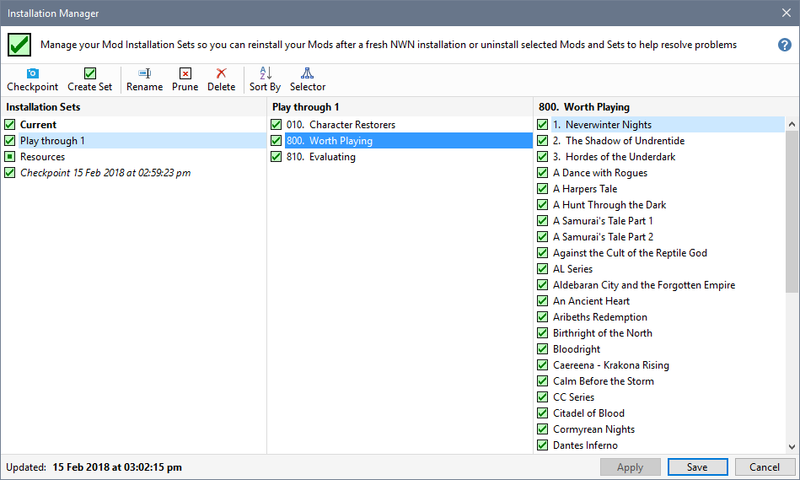 Use the Installation Manager to restore your favourite Mods after a fresh install of Neverwinter Nights or help track down problems with Mods that interfere with each other. Use the Installation Analyser to view the contents of each of the Neverwinter Nights installation sub-folders as well as where each file was copied from. The authors of Wrye Bash, which was the utility that inspired me to write the Installer Tool. @pscythe who provided support and code to read mod file information and scrape download information from The Neverwinter Vault project pages. This release contains some minor bug fixes and improvements. See Version History for details. Very original project, thanks for sharing it. As I download the file I have a question. Does this application also track.hak files? I feel certain it must, but your description doesn't explicitly state that capability. Yes the utility keeps track of .hak files. It tracks .wav, .erf, .hak, .bic, .mod, .bik, .bmu, .nwm, .bmp, .mdl, .dds, .tga, .2da and .tlk files. Thank you for the clarification and this most excellent utility. Looks very handy, does it manange overrides as well? It does handle Overrides, although it is always worth checking that the generated Mod Installer has placed the correct files in Overrides and Portraits folders (which is why there is a Move to Override/Portrait menu item). Many thanks for the nice feedback - always appreciated. Help: Updated to reflect the introduction of the Mod Explorer. Can I modify original modules and increase, for example, the number of companions (I have seen that it's possible), use this tool, and import this into modules? You can't use NIT to modify modules. However, if you modify a module, you can include your changed module by copying the relevant files into the NIT installer. I am not sure if that is what you were asking. Any feedback replies will be very much appreciated. Great idea, but where do we get the Framework for .NET from to be able to use the application? I haven't come accross that one before. Also, do you have any version of the .NET Frameowk on your system? If so, which version? (You can see which version/s you have by looking in Programs and Features - where you go to uninstall stuff). I guess you must be running Windows XP - gosh how dangerous :) - I could consider building a version that uses .NET v3.5, but I have concerns as to whether it would work (would need to convert NIT and the libraries it uses). I just checked whether I would be able to build a Windows XP compatible version (ie using the .NET Frameowrk 3.5). Unfortunately, I am unable to do this because I use functionality that was introduced after v3.5, which means NIT won't work. Sorry I couldn't be of any help on this. The pic of this mod showes amazing potential. I suppose that the author must have played too many mod of nwn to come up with this utility. Definitly will try this mod out the next time i reinstall nwn. 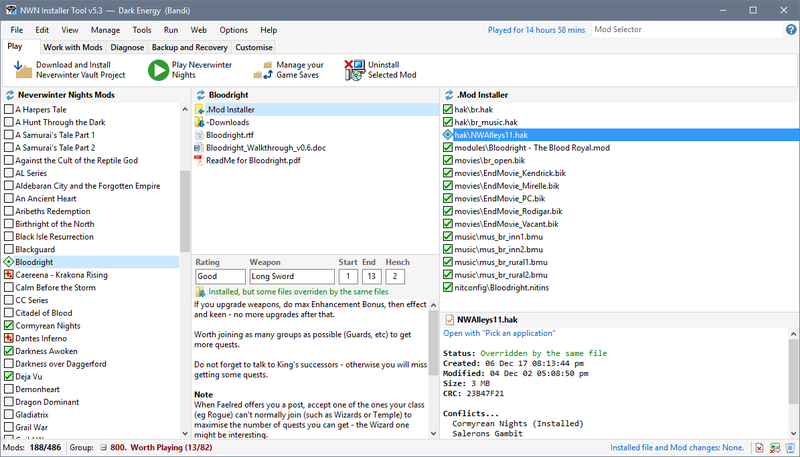 Fantastic application that sorts your mods and backup of your NWN files, in case mods alter or damage those files. Makes life 20x easier to run and manage mods for NWN. So far so good! I'll update with any issues that I may find. Keep in mind, I purchased NWN from GOG.com. I also downloaded the 1.69 patch from this NWN Vault, so the files are updated to the most recent and accurate patch. EDIT 1: The "Play NWN" Option does not work. The NWN window opens, and tells me SoU and HoU are both installed. I can select the Toolset, Readme, Configure, Update, and Exit options, but "Play" and "DM Client" options do not work. Is this an issue with the NWN Mod Installer Toll not being able to find the NWN.exe file? Many thanks for your kind words and rating - very much appreciated. When you press the Play button, NIT runs NWN's launcher (NWN.exe) and releases its own memory resources to reduce its footprint. Once this is done, NIT no longer has control. 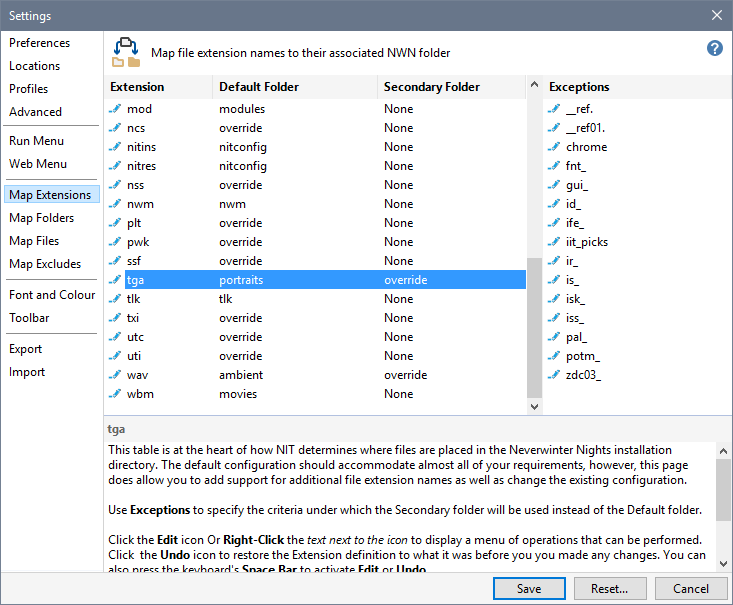 Have you set the properties for NWN.exe to run in Admin Mode (as described in the FAQ)? If not, this may be the cause of the problem. If you have, what version of Windows are you running? When you say the Play NWN does not work, what actually happens? Do you get an error message or any additional information that would help me understand what could be happening? That fixes it. I should have gone through the FAQ, my bad. I was not getting any error message. NIT would open the NWN launcher, and when I hit Play the launcher starts to load and then closes. Thank you for the very quick reply! Thanks for letting me know - very pleased to hear that your issue has been resolved. This sounds very handy but when I try to run the exe I get an error message. "the windows installer service cannot be accessed..."
Try Fix problems that block programs from being installed or removed and see if this helps to resolve the problem. Just installed NWN Enhanced Edition through the Beamdog Client, and can't get the installer to recognize the correct path for Neverwinter Nights. What does the mod installer tool look for? the .exe? The current version will not work with EE - there is no way to fool it. I am currently testing EE support which will be included in Version 5.0. If I feel it is stable enough, I may make a Beta Tester package available until EE is actually released, but I am unlikely to release version 5.0 until EE is released. It doesn't yet work with EE. That is for the next version. See the development thread here. I see from the project description that this does work for EE now. I'm interested because I'm looking for a one-touch method that Steam users might warm to. Setup failed because Avast, having analysed the file for a while, popped up something to the effect that it was a rare file that has been reported to the lab (not sure of the full text because it didn't log the notification). No doubt a false positive. Also, something about a missing dll. It seems I don't have .NET Framework installed (Microsoft advise using regedit to discover that). Just wondering whether NIT could be packaged as a one-touch install. Even unpacking 7z is rocket science to Steam users, I'm told. The setup program deals with pre-requistes such as the correct version of the .NET Framework and makes it easy to install. Not sure why Avast would flag the setup file - has passed many tests (including the ones performed by NexusMods. I could package it as self-extracting zip file that runs the Setup program, but have avoided that to date because people don't normally like downloading EXE files. For you to assess whether NIT would be of use to Steam users, you would probably need to try it out, which means getting past the block on the Setup program, which in turn will sort out the .NET Framework for you. Do let me know how I can help. Virus check passed. This morning, when I turned on my PC, there was a popup from the Avast lab saying the file is clean. I've never seen this before. Let me know how you get on and whether there is anything I can do to help. I finally upgraded to Windows 10 from Windows XP, so looking forward to testing this out. 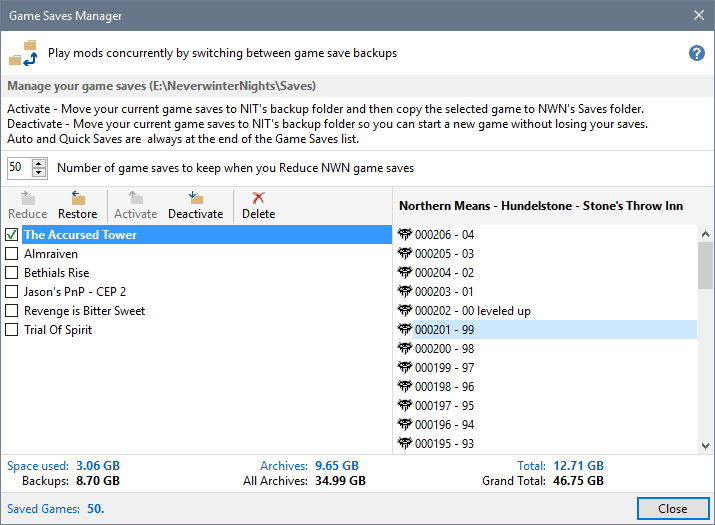 A great utility for everyone using Neverwinter Vault! Hoping to upload v5.2 tomorrow, which allows you to use the Vault's Project Page url to download and install Mods and their Required Projects in one go. The recent updates are awesome! The ribbon toolbar is super handy, especially the download functions. I'm currently running through all of my mods and finding peices I missed when I originally downloaded them manually. Thank you so much for your work on this! Suggestion for future release... For multi-part modules, like the Aielund Saga, it would be great if NIT had the option to download the "related projects". So if I'm downloading Aielund Saga Act 1 - Nature Abhors a Vacuum, NIT could offer the option to download Aielund Saga Act II - Defender of the Crown at the same time, triggering all six parts to be downloaded and installed. Many thanks for your kind words - very much appreciated. A good suggestioon about Related Projects. It was something I looked into, but decided against it because not all Related Projects are part of a series and I was unable to identify any logic I could use to determine which Related Projects were relevant. In addition, it would make the download process much more complex and more difficult to present a simple interface showing what will be downloaded. However, I will keep this in mind in case I think of something or someone suggests an approach that could be used. One possible approach that would not require the program to make decisions about the Related Projects, and would not complicate the interface, would be simply when the user is done downloading a mod, have a dialogue box asking the user if he would like to view and potentially download the Related Projects. If he answered Yes, then just have the program dump all Related Projects in a list and let the user select/de-select what he wants. Just brainstorming. Many thanks for your continued interest and suggestions – very much appreciated. At the moment I am going to leave as it is because you can use the initial Project Page to copy the Related Projects links to the clipboard and click Download Projects. 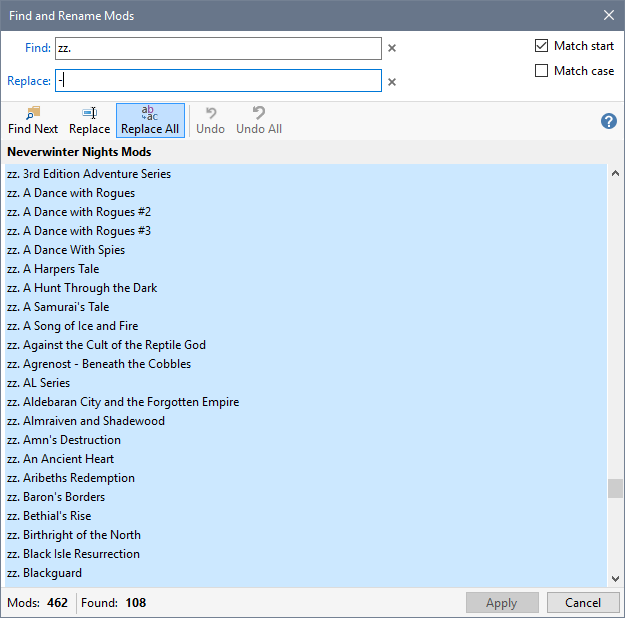 By repeating this procedure, you can download all the Mods in a series without having to visit each Project Page. This approach seems to achieve what you are suggesting, without having to ask users to respond to any messages (and are the steps I use when downloading a series). If I were to implement something, it would need to automate the above so that users perform a single download operation. So still worth thinking about, but pending inspiration at the moment. This tool is awesome. It really helps make it easier to use modules. - I was wondering if maybe there could be some sort of collaboration between the NIT and the PRC to get the PRC Module Installer working from inside the NIT maybe? - Also, adding hacks to custom mods with the toolset can be difficult and very time-consuming... would it be possible for the NIT to help make the process easier in general? As it is, it's very easy to look up mods on the vault and install them but having them work with stuff like the PRC and the CEP ends up being very confusing and frustrating. - A third idea/request would be to automate the transference of Steam Workshop mods from their independent folders to the regular folders in a way that put them under the management of the NIT while leaving blank placeholders on the separate steam folders to save hard drive space. Would that be possible? Many thanks for your kind words and vote – very much appreciated. I had a discussion on this topic with Shadooow (see NIT forum topic). Although it seems that NIT could use moneo to apply the required changes to mods, I had reservations regarding how to specify which mods to include or exclude. I have not excluded the possibility, but at present, I am still debating with myself whether to try and implement something. So far, apart from Shadooow, you are the only other person to request this feature. I do know that it would require some extensive investigation into a PRC, which I do not use, and then quite a bit of work to figure out how to include support. You can use NIT to create a patch-hak, which may meet some of your needs. I believe that aids for building mods is beyond NIT’s scope. If I ever get into mod building or modification, then I might gain sufficient understanding to create a tool for mod builders. At the present time, I simply don’t have the knowledge or expertise to help in this area. Any mod that lists CEP as a required project is already supported by NIT (ie it will download and install the required version of CEP for the requested mod). Am I misunderstanding the point you made about CEP? I did investigate this in some detail and concluded that consistent automation could not be achieved because workshop items are stored under a numeric folder, which makes identifying the mod in human readable format very unpredictable. In addition, Steam automatically applies any updates to subscribed items, which means that NIT would have to track the mods. I concluded that people could create NIT entries to track which workshop items were installed (see Help, Neverwinter Nights Installer Tool ›› Frequently asked questions (FAQ) ›› Why doesn't the Installer Tool show Steam's Workshop Mods?). Alternatively, download the workshops mods from another source (such as the Vault) and only subscribe via Steam when it is the only location for the mod you want to use. Many thanks for your suggestions. I apologise if my responses come across in a negative way – that is not my intention – I really welcome all suggestions, many of which have been implemented (such as the download and install, the ribbon to simplify the interface, etc). I do have to consider new features carefully based on likely usage versus adding complexity to an already complex program (about 40,000 lines of code).